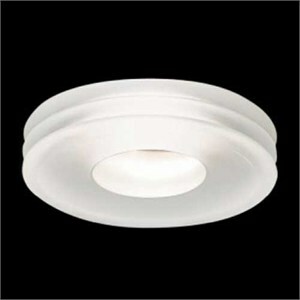 Bands or small disks of glass appear to float from the ceiling on this semi- recessed, low voltage downlight. Excellent illumination is provided from the MR-16 light source and the trims are available in clear crystal or satin white, frosted glass. Glass installs with a twist and lock operation. Fully recessed housing equipped with thermal protection, magnetic transformer and junction box. Suitable for installation in all types of modular ceilings and new construction. Mounting bars are provided with the new construction and IC housings. Remodel housings also available. Clear crystal or satin white. U.L. and cU.L. listed. For U.L. compliance, use enclosed MR-16 lamp.